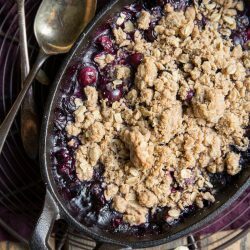 Eat your favorite summer dessert right out of the piping hot cast iron with this blueberry coconut cardamom crumble. The light and flavorful blueberries burst with lemon and coconut mixed in, with a cozy cardamom tinged crumble on top is positively crunchy! A year’s worth of hard work (and not so patiently waiting) finally all comes to fruition tomorrow. Cast Iron Gourmet is going to be released!! I’m somewhere between breathing a sigh of relief, and freaking the ever loving hell out. That combined with pregnancy hormones makes me a grab bag of emotion. You really never know what you’re going to get. But right now, I’m elated. And stunned. Stunned that my heart is going out to thousands of people in paper form, and that people might actually invest in my blood, sweat, lots of tears, dirty dishes, and the chapped hands that came with this. 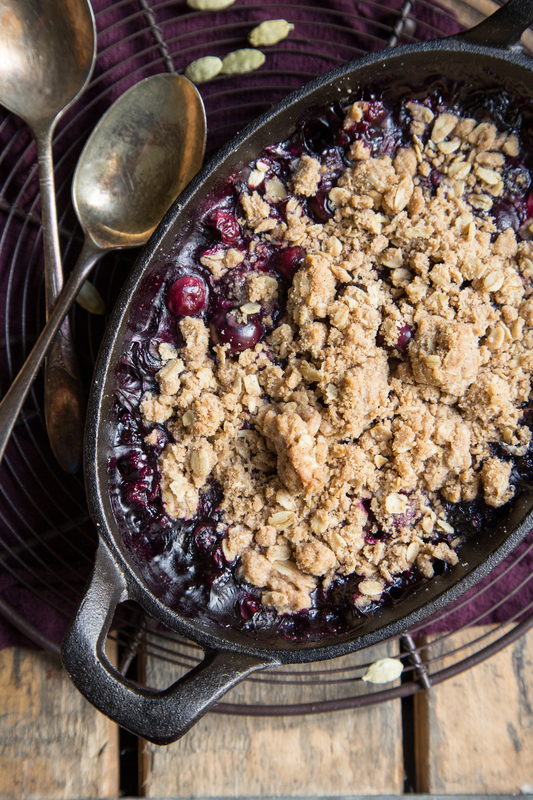 So because it officially comes out tomorrow, I wanted to share with you one of the first, and one of my favorite, recipes from the book – this blueberry coconut cardamom crumble. You can watch the video below of me making it as well! When the book first arrived, I just stood there, unblinking. It was finally tangible, real, and page flippable. What was my next step? Sharing it in a video. If you might have missed it, it’s below. Listen as I fight back tears of disbelief that it was in my hot little hands after all that time. Ohhhh, emotions. What can I say about this book? There have been so many people who supported me through it. It was written with love, cooked on the weekends, edited after work, scratched out, scribbled over, and all done in our little two bedroom apartment on a counter that was about six square feet in size. My goal was, and has always been, to make my passion of cooking approachable, and to demystify cast iron. I hope that that is achieved in these pages. If you haven’t ordered it yet, do it now! Tomorrow, release day, I’m giving away $250 in cast iron and tools to make your new journey a success. My essential cast iron kit includes the two pans that dominate this book, a 10″ skillet and my favorite 6 quart enameled Dutch oven. With that are the tons, scrapers, and brushes to ensure your pans last a lifetime. So, here we are a bouncing baby book on the way. This has been the most epic of years for Ben and myself and every bit of it has been chronicled with you along the way. Thank you for making it special. There is so much left to share and more to come, but for now with this latest milestone, I just want to express my gratitude – from the bottom of my heart. And my larger sized jeans. 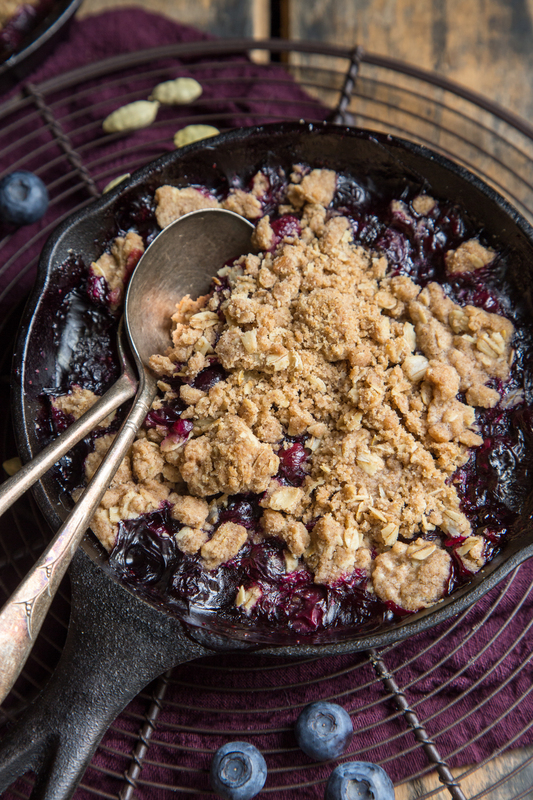 In your cast iron skillet, add the blueberries. Sprinkle the berries with coconut, sugar and cornstarch. Toss to coat the blueberries completely. Next, sprinkle the blueberries with lemon zest and lemon juice. Toss to combine again. A sugar sauce will start to for at this stage. In a mixing bowl, whisk together the flour, brown sugar, oats, cardamom and salt. Add 6 tablespoons of butter to the flour and oat mixture, and blend it with a pastry blender or your hands. Blend the oat mixture until large crumbles form, about 2-3 minutes. If the mixture looks dry, add the remaining butter and blend together. 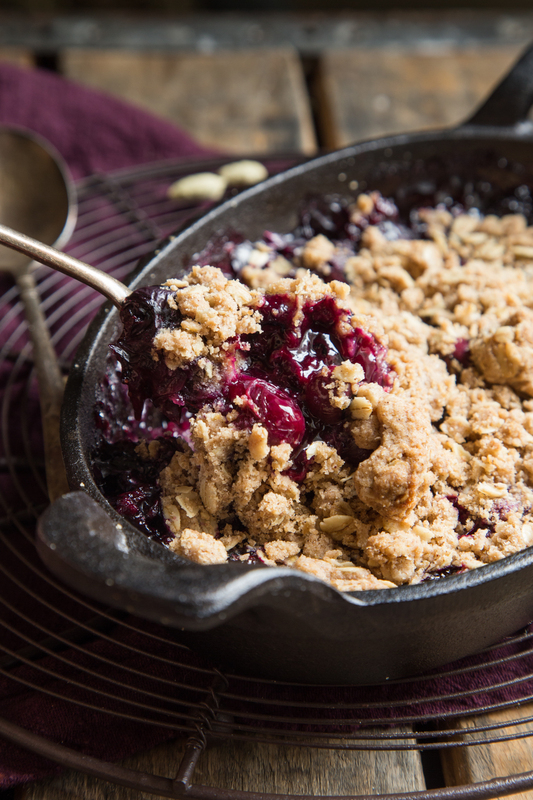 Sprinkle the crumble over the mixed blueberries and bake for 30 to 40 minutes. If you choose to bake these in individual dishes, reduce your baking time starting with 25 minutes, checking after 20 minutes to ensure the crumble isn’t burning. Serve with your favorite ice cream!